My trip to meet the children I sponsor actually began in 1955. That was the year my parents-in-law loaded up two toddlers and flew to their new home in Siguatepeque, Honduras. Since joining the Snider family, I have heard (and re-heard) countless stories of their lives as missionaries in Honduras with Mission Aviation Fellowship — the cows in the airstrip, the swimming hole, the parrot on the bike handlebars, the hot sauce in the back pocket, the ice cream for breakfast because the electricity went out…. Our standard joke is that Tom grew up on Gilligan’s Island, while I watched it on TV. Soon after our wedding, Tom and I happened to go to a Christian rock concert by Petra. They gave a presentation on the work of Compassion, and we thought it seemed like a good idea to sponsor a child in Tom’s home country, Honduras. Since then, we have had numerous children — Francisco, Javier, Marley, Maria and Alba. All of whom have had to leave the program for one reason or another. 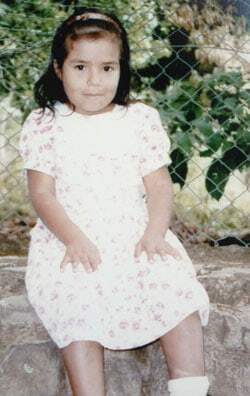 However, in 1996, we began sponsoring a little girl named Emma Yolanda Vasquez Caceres. It seemed providential. By this time, we had our own daughter named Emily who was only one year younger than “our” Emma. We corresponded, we sent Christmas cards, birthday money, more letters, always trying to be encouraging. Emma would send us pictures and tell us of how much she enjoyed school and life at the child development center in Minas de Oro. We talked of Honduras and Tom’s years there. She had visited some of the same places Tom had visited. As our own children neared high school graduation, so did Emma. As our own children started looking at colleges, so did Emma. Emma entered the Leadership Development Program and was our “first child” to go to college. The next year, our daughter left. Then, our son. The nest was truly empty. 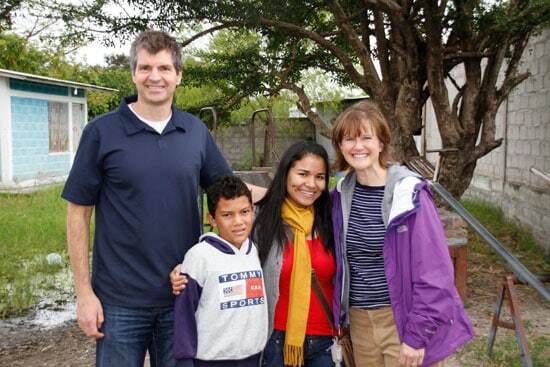 So we got another Compassion child in Honduras — this time, a boy — Dimas, age 10, in Comayagua. For years, I had tried to get my husband to go back and visit his home. I suggested mission trips, I talked it up….“one of these days” we’re going to do it. That day finally came when we got notice that Emma was going to graduate from college, during Thanksgiving week 2013. I’m a school teacher, so I would have three days off. Time enough to fly down, visit both Emma and Dimas, run out to Tom’s hometown, and get back in time for 7:00 a.m. morning duty at school on Monday. We were on. Then they changed the date … to the day before my choir’s holiday concert. We were off. Then they changed the date again. No better. Finally, with the blessing of our own children, we decided to go over Thanksgiving anyway, even though it was not Emma’s exact graduation day. As we flew into Tegucigalpa, all I could think of was what it must have looked like to my mother-in-law with her toddlers in tow — her new home for the next 18 years. Bittersweet tears came to my eyes as I felt her presence with us on that plane as it landed amidst a very crowded city. As we walked off the tarmac, Tom looked around as if he was a toddler himself. “That building hasn’t been changed.” “Those mountains are just as I remembered.” Memories came flooding back, and he immediately felt at home. Our first evening in Tegucigalpa was spent just relaxing and getting some authentic Honduran food. Again, something I had heard about for moving on to 30 years. Granted, my mother-in-law had mastered the art of refried beans, so those were no surprise. But as much as I hate to admit it, tortillas in the States are a pale comparison to the food we had that night. Early Thursday morning, we met Emma for the first time. I was utterly speechless. Granted, I don’t speak Spanish. I hoped my tears were saying what I felt. Tom muttered through some Spanish — what he could remember. I just stood there and looked at this tiny, beautiful young woman who had her whole future in front of her. We got in a car together and were told Emma wanted us to go to her home. Two hours away. Fine. Three and a half hours later, 20 miles of dirt roads, and enough conversation for Tom to start sounding fluent again, we reached her child development center in Minas de Oro. This was where all those letters had been written. This is where all those pictures had been taken. We met the three people in charge of the center. As Tom greeted them in his newly reaquired mother tongue, we discovered that Aldi, the man in charge of health services, had remembered Tom’s father when he had helped clean up from a plane wreck in 1965. Small world miracle #1. When we went to Emma’s home, we were greeted by an abundantly joyful and effusive woman — Emma’s mother. Remember…today was Thanksgiving day back home. And we were here. In Emma’s home. With her mother and sister. And tacos cooking on the wood stove. I cannot think of a better place to have been on Thanksgiving Day. Thanks be to God. Presents were exchanged, hugs were given, prayers were said, pictures were taken. But our Thanksgiving dinner of homemade tacos, Del Monte fruit cocktail, and Tropical cola beat any turkey, stuffing and pumpkin pie that even the best chefs could make. On the drive back, Emma told us of how when she was little, she would work 12 hours shifts picking coffee beans during the growing season — the equivalent of the summers my children spent at the local pool. She talked of how she felt worthless and hopeless and that life would never be any better. Then she got involved in the Compassion center. She is the third child in a family of three girls and a younger brother. Compassion generally accepts only two children from a family, but the center staff saw something special in Emma. What we thought of as a small part of our giving was literally saving her life. She got excited by school. She developed a sense of hope. She realized that there were possibilities out there. As we drove back to the capital city, she told us that her shoe-maker father and her mother who worked at the center had raised three college graduates — a future dentist, a future banker, a future teacher, and a future auto-mechanic (who would hopefully be attending college in the next few years). It was hard not to feel thankful that day for the abundant blessings in all of our lives. Friday was “Dimas day.” Emma and Isaac, our translator, met us early again that morning and we got in the same car for a short drive this time — an hour and a half. No dirt roads today, pavement all the way to Comayagua. After getting lost a bit in Comayagua, we arrived to a woman with her arms around a very sullen looking 10-year old boy. There he was. No longer a picture. A real boy. He was wearing soccer cleats with his school uniform, so I immediately grabbed the soccer ball we brought for him. He seemed happy, but a bit overwhelmed. Small world miracle #2: Emma got out of the van, saw Dimas and his two sisters, and realized she already knew them! They had lived in her hometown briefly before moving to Comayagua. What are the chances? 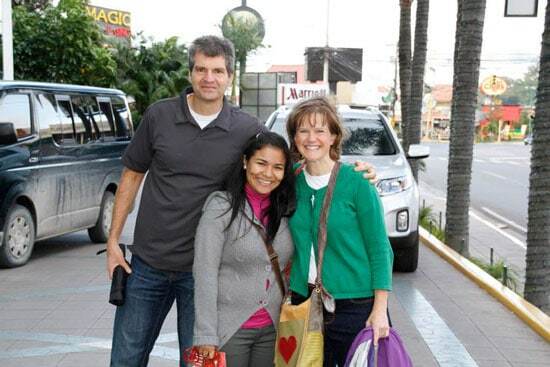 We sponsor two random children in Honduras … and they know each other! Immediately, Tom and I both looked to Emma as if to say, Please take care of Dimas. Time for a side note … it turns out that Emma is kind of a big deal in the Leadership Development Program. First, she was the third child from one family to be accepted into the Compassion program, a rarity. Next, she entered the Leadership Development Program after her sisters, and finished before them. 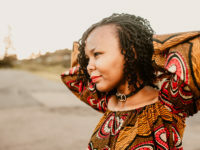 It turns out, she is a super-motivated, mover-shaker type, and just radiates the love of God. The pastor at the church where Dimas goes to school recognized Emma from the LDP graduation. While we were visiting Dimas’ child development center, the pastor was busy talking Emma into coming back to visit and talk to the children. It was such a relief to know that Emma might be able to check in on Dimas and keep an eye out for him. We spent some time walking around the premises and seeing Dimas’ classrooms. As a choir teacher at a college preparatory private school with a hefty endowment and where the biggest dilemma is whether each child should have a laptop or an iPad, I promised I would never complain about the facilities at my school again. Cinderblock walls, a few decorations, one beat-up filing cabinet, papers and teaching materials that had been used and re-used many times humbled me, but the gratitude I saw there versus the entitlement I see here stood in stark contrast. We were told Dimas’ mother had just had some surgery the day before and was not feeling particularly well. So as we sat at their house and visited, we were struck by the difference in medical care between the two countries — in the U.S., we would have expected to stay overnight at the hospital, or go home and rest in a bed and have someone bring us food and painkillers. There, she was at home, not in bed, not on painkillers, and probably still planning on cooking for the family, and then was expected to walk to the hospital for a check-up. Again, the contrast between life there and life here was overwhelming. Dimas lives in a three-room, open-air adobe house. Dogs roam freely through the house. I don’t even know if the dogs are theirs. At our house, we had spent the fall redecorating our bedroom and bathroom simply because it still looked like 1992. Time with Dimas at his home was spent playing Frisbee and taking him to lunch at Pizza Hut. It was a lovely time, and when it came time to leave, Dimas hugged Tom for a solid three minutes. I really worried we might have to pry Tom loose. With his own father having passed away four years ago, it was obvious Dimas needed a dad. The rest of the trip was not particularly Compassion oriented, as it was time to go visit Tom’s childhood home. Isaac, our translator, and Emma drove with us to Siguatepeque and dropped us off at a hotel near the center of town. It was hard to let them go, knowing we might never see Emma again, but hopeful we would. And we turned our attentions to looking into Tom’s childhood. We set out to walk through town and find Tom’s elementary school, which is now a seminary. As we stood in the cold drizzle on the front steps, zipping our jackets to brace for the “norte,” the owner of the hotel offered to give us a ride to the seminary. I was finally starting to understand where my father-in-law got his life philosophy of “the Lord will provide.” It did seem like when we needed something, somehow it was provided. We arrived at the seminary, and immediately met up with Tim Nelson, who was currently living at the seminary as an administrator and who happened to have been in school with Tom as a child. For the next two hours, it was a tour of the school and the “Do you remember?” game. It was awesome to finally see the swimming hole. Granted, now it is about 12 feet lower in its water level and heavily polluted, a sad disappointment for Tom. As we ate breakfast the next morning, in advance of finding Tom’s childhood house, the owner of the hotel came over to talk with Tom. 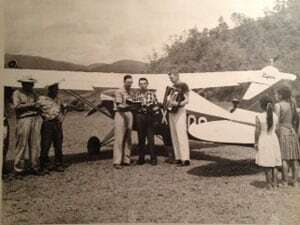 It turns out he is maybe four years older than Tom, remembered the missionaries with the airplanes, and knew many of the same people that Tom had remembered from his childhood. Again, what a small world we live in. Tim’s wife, Julie, picked us up and took us to find Tom’s house. First we found the hangar where the airplanes had been kept — it is now a school. Then we found the airstrip — now about the size of a soccer field. Maybe this was God’s little joke with me, but there were actually two cows standing out there as if to say they’d been there for 40 years waiting so I could see the cows on the airstrip — a standard in family lore. We turned around, and there was the corner upon which Tom’s house should be standing. The only problem was, all we could see was an 8-foot-tall wall with knife blades sticking straight up out of it. The “doors” into the property were heavy metal doors, which reminded one of bank vault doors. Our immediate thought was, A drug lord lives here. I think Tom felt at that point that maybe it would have been better to leave things alone, not come to Honduras, and let his house and “his” Siguatepeque live happily in his memory rather than come back and see the reality. Julie was not easily deterred. She rang on the doorbell several times, pulled the car up so Tom could climb up on top of the car and see over the wall, and rang the door several more times. The owners of the home finally came to the door — their fears probably matching ours. We thought they were drug lords, they probably thought we were thieves. Then the owners of the house opened the “vault,” and let us in. We found a little piece of heaven. Flowers bloomed everywhere. Grass, the first we’d seen on the whole trip, was immaculately manicured. Fruit trees, bushes and flowering plants were everywhere. Tom’s mother would have been happy to see her yard looking so beautiful. The owners were a retired couple who had lived there for 25 years, and it was obvious that they loved this house as much as Tom’s family had. They invited us in, and we saw the original tile floors, the original windows, and wait for it …THE fireplace. 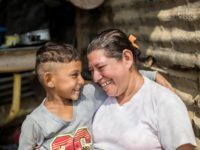 Our minds were flooded with memories of Tom’s Grandpa Fleegal, a brick mason who had traveled to Honduras to build a fireplace and chimney before his daughter’s house was even constructed because he wanted her family to have a warm hearth, knowing that would be their only source of heat. It was nothing short of a miracle. Fifty-eight years in the making, the entire trip was a miracle. Compassion has changed the lives of Emma and Dimas, not to mention all the other children that Compassion helps. And Compassion International also changed me. They enabled me to meet two young people who will forever inspire my life. I’ve been given a new perspective on what is really important and a renewed sense of mission to do God’s work wherever I am. I could never have made the journey my mother-in-law made in 1955. I’m not cut out for the missionary life. But I am now playing my part in the story. 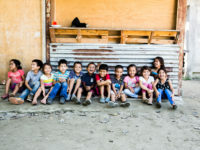 The story will continue as Emma goes on to start her career teaching more children in Honduras, as Dimas grows and hopefully stays in the program and becomes all he dreams of becoming, and as his sisters get their educations and together they carve out a better life for their family. About the Author: Anne Snider, born and raised in Knoxville, Tennessee, is a choral director at a private school, where she teaches 5th through 12th grade children. I enjoyed this post very much. I enjoy stories about sponsors and their children. Thank you. What an amazing story of the way God has threaded His abundant grace and love into you & Tom’s lives, and the lives of Emma and Dimas and their families. I found your story such a rich blessing to read as I have 2 sponsored children there and 2 formerly sponsored children there. I’ve been to the San Pedro Sula region but never to Tegucigalpa. You ARE a missionary – bringing God’s love to children in Honduras as well as those you interact with here in the U.S. Dios te bendiga. Thank you for sharing this wonderful story, Anne! The photos are terrific and definitely help tell the story. I hope you and Tom can return to Honduras to visit Emma and Dimas again someday. They are so blessed to have you as their sponsors! Beautiful post, Anne; thanks for writing it! I live in Honduras, and guess what??? I know Emma!!!! She is very sweet! 🙂 Thank you for sponsoring this children in Honduras, thank you so much!! May The Lord bless you abundantly, more than you can imagine! Amazing story and beautiful testimony! I was so surprised that you folks got the idea to sponsor while at a Petra concert… I’ve hosted their lead singer, John Schlitt, in concert here at our church. 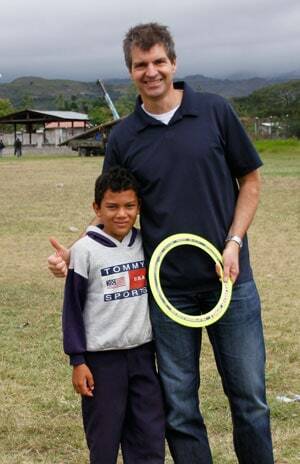 Did you know that John joined Petra because of a Compassion International employee introducing them? Amazing how God works things out.